The American West Project aims to make the West feel more authentic by revamping scenery and adding in details. For example, the region is famous for its outdoors and stunning recreation areas. Added national forest boundary signs, summit/continental divide elevation signs, and Native American reservation boundary signs (based off their real-life counterparts) help reflect this. Scenery in some areas is also changed, mostly by swapping the generic and unathentic default pine trees to the more natural ponderosa pines from the New Mexico DLC. The result is a West that feels more like the West. – Changes the pines in Flagstaff and Show Low (Show Low is not complete) to the more realistic ponderosa pines. – Adds national forest boundary signs for Cocinino, Prescott, Tonto, Kaibab, Angeles, and Sitgreaves national forests. – Changes the Verde River vegetation at the I-17 bridge to be more realistic and verdant. – Revamps a section of I-580 south of Reno to make the Sierras larger and greener, while adding sagebrush along the highway (Local opinion needed). 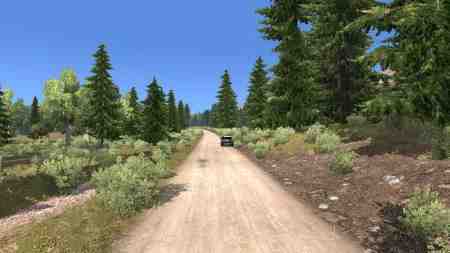 – Adds pines to the mountains along Donner Pass, making them look a little more realistic and pretty. – Adds summit elevation markers along interstate highways. – Adds continental divide markers along New Mexico highways that cross it.